April 25, 2011 by abby in "family", "foodie", "recipe"
﻿I hope you had an enjoyable Easter. My day was full of goodness. One of the best moments of the weekend was talking to my nephew in Nebraska about his Easter egg hunt. He is four and just as fun as my brother was back then. They live in a town of about 270 people. 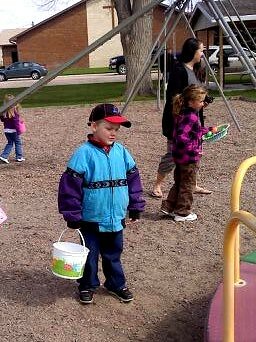 The city does an egg hunt at the park every year. All the kids stand on the curbs surrounding the park which covers a small block. There are eggs everywhere in the park. As soon as the fire department sounds the whistle all the kids take off running and screaming. They fill their baskets full of eggs and their bellies full of candy. This is what I love about small towns. Needless to say, I heard most of this story from mom. He was too busy painting eggs when I called, so the phone was handed over. On another note I was in charge of frosting the Easter cake this weekend and chocolate was the choice. Since all the cocoa powder went into the cake I had to scramble for a recipe that didn't include it. I was very pleased with the recipe I found from this website. I'm not a big chocolate fan, but I would certainly make it again. MELT chocolate in saucepan on very low heat, stirring constantly; set aside. BEAT butter in large bowl with electric mixer on medium speed until creamy. Gradually add about half of the sugar, beating on low speed after each addition until well blended. Add chocolate and vanilla; mix well. ADD remaining sugar alternately with the milk, beating until well blended after each addition. Use to frost your favorite cake or cupcake recipe.